I find hypnosis scripts incredibly useful. Over the years I've used a lot of scripts, with great results. They are usually hypnosis scripts written by other people, but more and more I found that the script books weren't really dealing with my client's problems and I was having to ad-lib so much that I ended up having to write my own scripts. This is primarily because I like to have some written reference while I'm working even if I end up just using the script to remind me of the areas I need to cover. However, I find that with some problems, particularly those that crop up over and over again, like self-confidence, self-esteem, IBS, and weight control - that I can keep using a reliable script many times with minor 'on-the-fly' modifications to suit a particular client's needs. So I offer these hypnosis scripts to you for a nominal charge. They have all been used successfully on my clients, so I feel certain they will be of benefit to others. I would also like to point out that the scripts are complete sessions. I have provided hypnotic inductions, deepeners and ego strengthening, though naturally you can use your own if you wish. If you are not a hypnotherapist and are looking for some low-cost help. These scripts can be used for self-hypnosis sessions. All you have to do is read them into a recording device, and then play it back at a time when you can settle back, relax and remain undisturbed for 30 minutes or so. Weight loss is something a lot of people struggle with. When you get a little help from your subconscious mind the whole business can become so much easier. 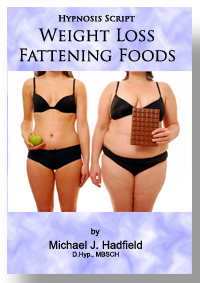 This script is one I've been using successfully with my weight loss clients for many years. I also use it on one of my weight loss CDs. It is designed to produced a deep state of relaxation followed by direct suggestions to break the attraction of fattening and unhealthy foods. Once the power of fattening foods is broken it is so much easier to make effortless and enjoyable healthy eating choices. After one session using this script many clients are surprised, and very pleased, to report effortless weight loss when they return a week later for their next session. Even if I do say so myself - try it, this one is really good. Confidence is something most people would like more of - especially when they have to give presentations, or a speech at a wedding. Life is much easier when you have the confidence to say 'no'; to ask for what you want rather than just put up with what you get; or even just to speak your mind and offer your opinion without fear of consequences. 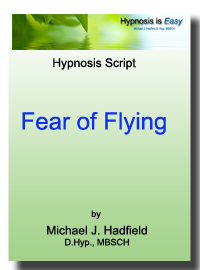 This hypnosis script will prove most helpful in easily banishing fears and concerns about life. Hypnosis is great for treating fears and phobias. Flying is a common problem that affects many people. I have used this script many times with clients and have had people telling me that now they can really enjoy their holiday without the spectre of the flights spoiling their anticipation of the holiday, or enjoying it while they are away. One of the most valuable uses for hypnosis is in the relief, or even the removal, of pain or discomfort. 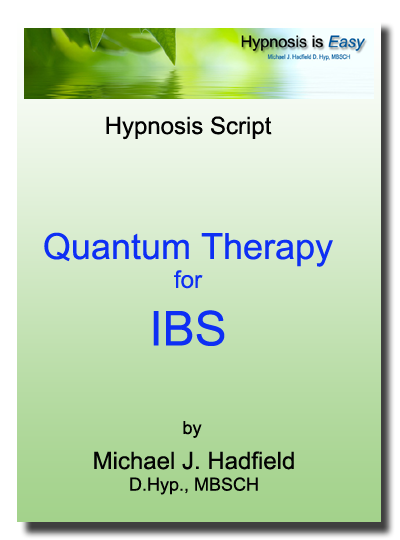 This script is designed to assist your client by providing relief from the discomfort of IBS. It uses a new approach, that of instructing the subconscious to be aware of the quantum nature of reality and, therefore, that body and food are all just energy with diferent vibrations. The imagery used to facilitate healing is consistent with these ideas. This is a script I have used successfully with many of my IBS clients. Only £3.98 for relief from discomfort. Obviously I cannot guarantee that you will achieve the results you desire with any of my scripts, because part of the solution is in your hands, or with your client. Hypnosis simply makes difficult things easier. That said, I also understand the reluctance to hand over your money for something you aren't really sure about. So I am offering you a 30 Day, money back, guarantee. The guarantee is simply that if, for any reason, you aren't happy with your purchase, just email me within 30 days of purchase and I'll refund your money. No hassle, no explanations required. Just let me know the script didn't meet your needs, that you won't be making any use of it, and you'd like your money refunded. I only want satisfied customers. I am prepared to back the quality of my work, and the benefits it gives. So effectively what I'm giving you is the chance to try my stuff, knowing that if you feel it isn't really for you, it won't have cost you a penny. Don't forget to let your friends know about this too.